This week's Website of the Week goes to the lively and whimsical site of The Mad House: Play and Party World. As its name suggests, the site encompasses a stimulating colour scheme and use of shapes throughout the design, as influenced by its logo. A perfect representation of a very active business and a great example of brand strength. 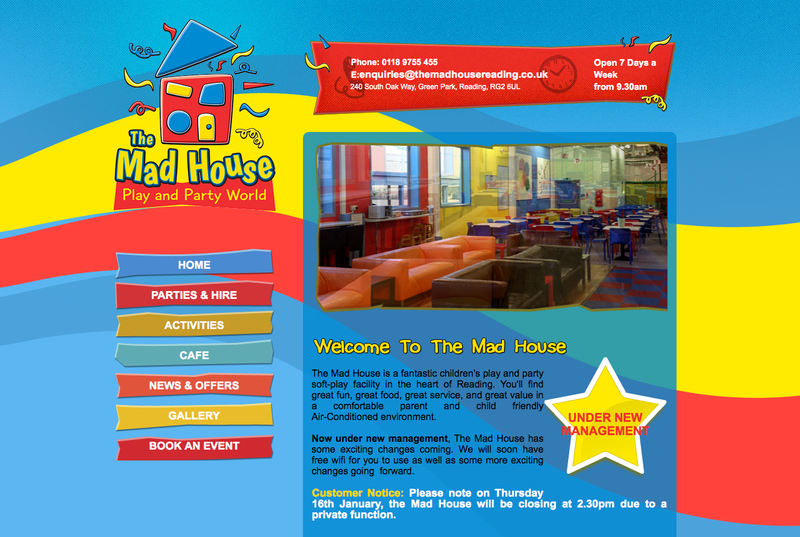 The Mad House is a fantastic children's play and party soft-play facility in the heart of Reading which as of recently, is under new management. You'll find great fun, great food, service, and value in a comfortable parent and child friendly air-conditioned environment. They have many party packages available, whether you just want maximum fun on the play equipment or want to mix it up with some traditional games and even X-Factor activities. Any birthday child and their guests are guaranteed to have a great time. The first thing you will notice about this site is the original layout. It has an almost floating content area, logo and sidebar menu. The logo, supplied by the client was the basis of all design choices which you'll notice in the colours and shapes used. Colours and shapes, perfect for the client's business and perfect for standing out to busy parents as well their inquisitive children. It fits the design brief of The Mad House perfectly, "Must be bright and colourful, fun and interesting, interactive!" You'll also notice the gallery uses our Lightbox effect. This is perfect for a business where images of their premises are key to attracting business and clients. The colour images pop out in full on the page in one swift movement and darken the background so focus is brought to the image alone. This gallery can be added to and updated by the client as easily as clicking a few buttons in The Toolkit at a moment's notice. Speaking of The Toolkit, the client has already managed to use their new website so speak out to clients and website visitors alike with their plans for functions for this very week! A great example of using their new CMS to the utmost and making the most of their web presence on behalf of their brand. The client was also pleased with their new website and declared the Team at Toolkit as "punctual and friendly" with 4.5 stars.